On Monday, we compared maps of Winchester over time. We looked at pre-war, post-war and current day to see how Winchester has changed and predict as to whether people would have been evacuated to Winchester during WW2. We headed outside in the sunshine and made a human map of Winchester to help to understand where we are. 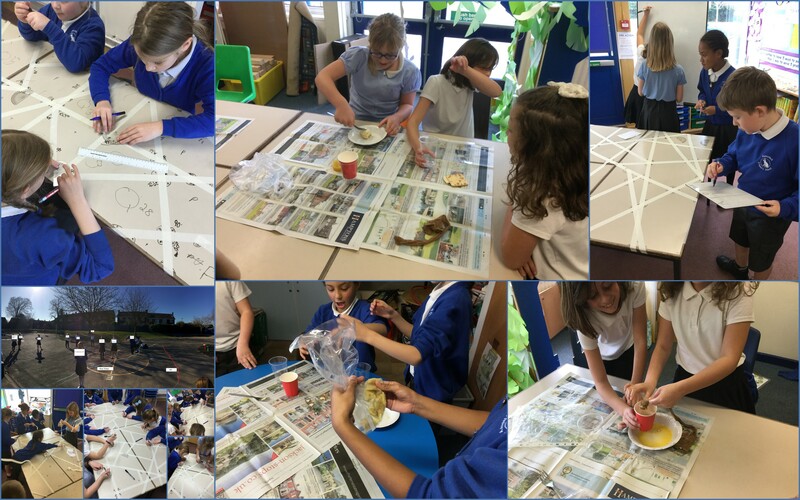 On Thursday, while the year 5s were swimming year 4 carried out a digestion experiment to simulate the digestive system, it was super gross and they loved it! On Friday to round off our geometry week, we carried out an angles investigation to identify and measure different angles. We also looked for different shapes, there were 42 triangles! We loved it. Check out the pictures of our awesome week. The space homework is looking great and we are looking forwards to sharing it with everyone. Thank you to all the families that have helped produce such a variety of pieces.